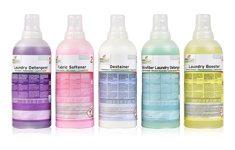 Ecodet Easy are highly concentrated, ecological laundry detergents in an intelligent and energy neutral dosing system: effective and with a great result. The concept is especially developed for the washing of all kinds of textiles in semi-professional washing machines. 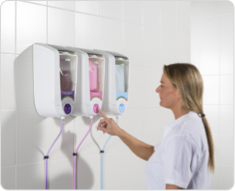 Intelligent 3-in-1 dosing system with highly concentrated, ecological laundry detergent (up to 5 times more concentrated than traditional products) for perfectly clean textiles in a professional environment. Highly concentrated, ecological laundry detergents (up to 5 times more concentrated than regular products) in easy to use dosage bottles.